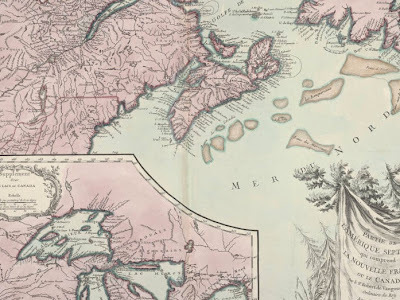 In a recent quest to explore American maritime history, I tumbled across Joshua M. Smith’s Borderland Smuggling: Patriots, Loyalists, and Illicit Trade in the Northeast, 1783-1820. Smith tells the story of smuggling in Passamaquoddy Bay at the mouth of the St. Croix River between Maine and New Brunswick. As he explores what smuggling meant to those involved, he also investigates the attempts of different governments to enforce boundaries. That, in turn, got me to thinking about just how malleable national boundaries really are. In retrospect, that seems like a no-brainer, and probably is for most historians. But I’m accustomed to thinking of national boundaries as lines that divide land, demarcations that are often as stark in reality as they are on a map. In The Medicine Line: Life and Death on a North American Borderland, Beth LaDow explored the meaning of a hundred miles of border between Montana and Saskatchewan. She showed the power of national boundaries to change the fortunes of people escaping from the law on either side of the border. Most notably, perhaps, Sitting Bull and his people crossed that “medicine line” after the Battle of Little Bighorn, escaping to Canada to avoid the wrath of the U.S. soldiers sent to hunt them. With examples like that in front of me, land boundaries have always seemed terribly clear. Somehow, seeing Smith illustrate the concept of a boundary through water rather than land brought home just how hard it is to delineate a marker between nations. Men who smuggled in Passamaquoddy Bay spent very little time worrying about where the boundaries were, just as people who fish today often work hard not to notice when they “drift” into foreign waters. An artificial boundary dividing the bay had very little meaning for the everyday lives of people in Passamaquoddy, except when governments got involved. That sudden realization—dawn breaks over Marblehead!—got me to thinking about national boundaries in general. To what extent are they entirely artificial, reflecting the wishes of a central state rather than the realities of life on a borderland? To what extent is the idea of a national boundary a modern concept? And if it is a recent idea, will it continue to be relevant as technology continues to break down borders? Maybe I’m behind the curve on this idea, but it’s sure got me thinking . . . In 2008, Mark Stein wrote a book called How the States Got Their Shapes, which eventually became the basis for the History Channels segment of the same title. Their point is that there is real history behind the lines on the map, and everyone should, if anything, at least be aware of this fact.